Last Sunday night, Hollywood once again reared its ugly political head for the 75th annual Golden Globe awards — otherwise known as the “Diet Oscars”. Throughout the star-studded evening, legions of political satirists and celebrities alike took a stab at political commentary. Sexism and the #MeToo movement received the overwhelming majority of focus; Natalie Portman in particular took great pleasure in announcing the “all-male nominees” for best director. Amongst the crowd, a familiar face emerged. Oprah Winfrey, once the most exalted deity of daytime talk, spoke to the plight of women everywhere, retelling the accomplishments of her idols Sidney Poitier, Gale King, and her mother Vernita Lee. 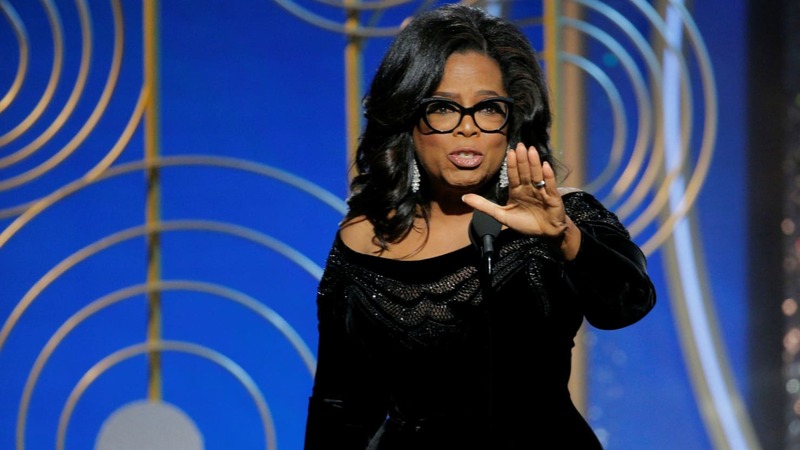 Winfrey’s speech inspired so many with her calm demeanor and inspirational prose that almost overnight it bred rumors of a presidential run from the former talk show host. In fact, CNN reported that two of Winfrey’s friends, who requested to remain anonymous, indicated Winfrey is “actively considering” running for office, primarily at the behest of her confidants. Oprah’s foray into the political realm is certainly not unheard of. Since Trump’s ascension to our nation’s highest office, droves of celebrities — from Mavericks owner Mark Cuban to the joint Hanks-”The Rock” ticket — have expressed an interest in leading the United States. Even more absurd names have been thrown into the hat, including The Telegraph’s assertion that Malia Obama — a college student who does not meet the age requirements to serve as president — might challenge Oprah’s potential Democratic nomination. Qualifications, in this sense, form the crux of proper presidential vetting. To become a successful president, one must not only have great ideas, but be able to implement those ideas in a noxious, toxic, stressful and blisteringly paced environment. The recent wave of support for celebrity politicians ostensibly stems from the American citizenry and their visceral distaste for politicians. The political establishment bears its fair share of systemic problems, from increases in political polarization and Congress’ recent ineptitude at passing legislation, to perceptions that politicians are nothing more than corrupt, lying and excessively bureaucratic bastardizations of our founding values. Celebrities, on the other hand, seemingly bear none of the damaging and harmful qualities that Americans decry of politicians. Celebrities are wholesome, share “our” values, support “our” causes, and generally have inspirational and inoffensive things to say. They appear poised and polished, speak intelligently, and are undoubtedly successful. I mean, how else would they have risen to the highest ranks of stardom without being innately successful people? Such an impulse to eschew political experience in favor of popularity and trending social movements fundamentally mischaracterizes the nature and difficulty of the presidency. While political parties bicker back and forth about how best to run the country, such discussions operate under the critical assumptions that those debating are qualified to do so. Qualifications, in this sense, form the crux of proper presidential vetting. To become a successful president, one must not only have great ideas, but be able to implement those ideas in a noxious, toxic, stressful and blisteringly paced environment. One must understand the finer details of bureaucracy, know how to work well with a diverse group of people, and maintain composure under the constant scrutiny of the public eye. Qualified presidents must also be well versed in a myriad of academic and social disciplines. From economics and finance, to military strategy and foreign affairs, presidents must have a diverse and expansive skillset in order to fully understand the complexities of running both the largest economy and military on earth. Just because a celebrity supports the Women’s Rights or Black Lives Matter movement does not imbue them with an understanding of the Federal Reserve or the legislative process. Trump’s celebrity background did not prepare him for the arbours of the presidency any more than an ordinary politician. Who then can reasonably claim another celebrity with a similar lack of applicable experience, like Oprah, would fare any better at the finer job responsibilities the presidency requires? Even technical skills often go unmentioned by proprietors of the celebrity president. Presidents must be able to author rigorously formatted legislative briefs, have impeccable public speaking skills, and understand how to command an army. Does a 25-year stint on television really qualify Oprah to hold the nuclear football? Does it really bear any relation to military policy at all? I think not. Have we forgotten that our current president, Donald J. Trump, remains a prominent celebrity? Have we forgotten The Apprentice? Trump is a celebrity through and through, and despite your feelings on the merits of his ideas, his qualifications for office are seriously lacking. In the wake of Michael Wolff’s controversial new book, Trump’s celebrity stature characterizes himself as nothing more than a child contained by his political babysitters, with no understanding of the finer details of legislation. Even if we criticize Wolff’s credibility, and even if we take only 15% of what his work alleged at face value, the volumes of corroborating evidence seem to confirm the worst: Trump’s celebrity background did not prepare him for the arbours of the presidency any more than an ordinary politician. Who then can reasonably claim another celebrity with a similar lack of applicable experience, like Oprah, would fare any better at the finer job responsibilities the presidency requires? As much as our political system tries to push these issues aside in favor of partisan hackery and ideological bickering, elections ultimately come down to qualifications. Simply electing an individual who shares your beliefs or vision for the country does not guarantee that individual has the mental fortitude, applicable skills, or relevant experience to put that vision in action. When we properly vet each increasingly ridiculous celebrity candidate for their obvious lack of qualifications, the dreams of an Oprah Winfrey presidency transform into more Trump-hating fanfiction.